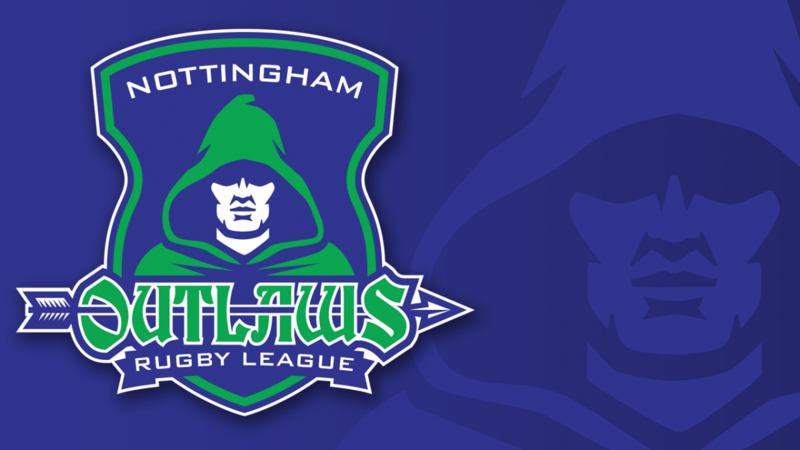 Nottingham Outlaws failed to extend their three match winning run on Saturday when they were comprehensively beaten by East Hull in Yorkshire on Saturday. A weakened Outlaws side tried their best to stem the tide but they were no match for the slick Hull outfit who notched 11 tries in a heavy 64-6 Nottingham defeat. The omens didn’t look great in the build up to the game as the Outlaws coaching staff were forced into making a number of changes to the side that did so well last time out at home to New Earswick. Things then went from bad to worse as a series of late withdrawals left the squad down to bare bones on the day. The changes started in the threequarters with Charlie Clarke and Conor Foulkes forming a new look centre partnership whilst on the left wing Ollie Welsh came in for his debut whilst Jimmy Goodwin, impressing in the pack in recent weeks, dropped back into the right wing position. Strachan and Cunliffe provided some continuity at half back whilst the starting pack remained largely unchanged with Harry Walton recovering from a knock to take up the number nine slot. However skipper Oliver Dale’s injury saw Alex Wright return to the loose forward role and Kyle Widnall came in for his debut in the second row. The Outlaws could not have made a worse start as the speed and fluidity of the East Hull play the ball caught the Outlaws well and truly on the back foot. Indeed in the very first set the home size advanced fully seventy metres up the field before pushing the ball wide and opening the scoring with a try in the corner. Things quickly went from bad to worse three minutes later a simple missed tackle in the East Hull twenty saw the home side break clear and go full length of the pitch to double their tally to 12-0 with only four minutes on the clock. The Outlaws did rally briefly when debutant Kyle Widnall made a forty metre break before being hauled down but back to back penalties saw the home side grab the initiative and stretch the lead to 18-0. Try as they might the Outlaws could make little headway in possession and when the home side grabbed three quick fire try’s and after only twenty minutes played the Outlaws found themselves 36-0 down and staring in the face of a record defeat! To their credit the Outlaws rallied briefly and Jimmy Goodwin almost got across the home line but was held up short by three home tacklers. However the Outlaws attacking moments were few and far between at this stage of the game and another home score just before the break made it 42-0 to the home side before the referee drew thankfully drew the first stanza to a close. The emphasis in the half time talk was all about trying to slow down the speed of the East Hull play the ball down that had been too hot to handle in the first forty. However such tasks were easier said than done and straight on the re-start the home side extended their lead to 46-0. To their credit the Outlaws dug deep and began to even up the share of possession and field position. They forced back to back sets on the end of some good tactical kicking by Dean and Cunliffe and they were finally rewarded after 55 minutes of toil when George Strachan latched onto an reverse ball at short range to open the Outlaws account. Dean converted from bang in front to reduce the deficit to 46-6. The second half was turning out to be a much more even affair with the Outlaws managing to maintain periods of pressure on the home line. However their limited options from the bench saw them tire towards the end of the game and three try’s in the last fifteen minutes saw the home side pull away again and close out the game with a heavy 64-6 Outlaws defeat registering on the home scoreboard. Despite the heavy defeat all of players came of the pitch with credit, especially after a battling second half performance that saw them stem the tide against a home team that will be there or thereabouts come the end of season play off final. Kyle Widnall and Ollie Welsh both made promising debuts whilst Charlie Clarke well well at centre to take the man of the match award. Next week the Outlaws return to home duty when they face Bramley at Lenton Lane, a match they need to win if they are to keep their top four play off hopes alive!